تاتاری, علی اصغر, دهقانی فیروزآبادی, محمدرضا, سرائیان, احمدرضا, آریائی منفرد, محمد هادی, یدالهی, رحیم. (1395). اثر روش شستشو بر ویژگی‌های خمیرسازی باگاس در فرآیند دی اکسید گوگرد- اتانول- آب (SEW). مجله صنایع چوب و کاغذ ایران, 7(4), 549-559. علی اصغر تاتاری; محمدرضا دهقانی فیروزآبادی; احمدرضا سرائیان; محمد هادی آریائی منفرد; رحیم یدالهی. "اثر روش شستشو بر ویژگی‌های خمیرسازی باگاس در فرآیند دی اکسید گوگرد- اتانول- آب (SEW)". مجله صنایع چوب و کاغذ ایران, 7, 4, 1395, 549-559. تاتاری, علی اصغر, دهقانی فیروزآبادی, محمدرضا, سرائیان, احمدرضا, آریائی منفرد, محمد هادی, یدالهی, رحیم. (1395). 'اثر روش شستشو بر ویژگی‌های خمیرسازی باگاس در فرآیند دی اکسید گوگرد- اتانول- آب (SEW)', مجله صنایع چوب و کاغذ ایران, 7(4), pp. 549-559. تاتاری, علی اصغر, دهقانی فیروزآبادی, محمدرضا, سرائیان, احمدرضا, آریائی منفرد, محمد هادی, یدالهی, رحیم. اثر روش شستشو بر ویژگی‌های خمیرسازی باگاس در فرآیند دی اکسید گوگرد- اتانول- آب (SEW). مجله صنایع چوب و کاغذ ایران, 1395; 7(4): 549-559. فرآیند خمیرسازی دی اکسید گوگرد- اتانول- آب (SEW) می‌تواند به عنوان یک فرآیند هیبریدی بین فرآیند خمیرسازی سولفیت اسیدی و حلال آلی در نظر گرفته شود. این فرآیند به‌منظور جداسازی ترکیبات اصلی مواد لیگنوسلولزی (سلولز، همی‌سلولز‌ها و لیگنین) اخیرا مورد توجه قرار گرفته است. این مطالعه با هدف بررسی اثر روش شستشو بر ویژگی‌های خمیرسازی باگاس در فرآیند جزء به جزءسازی اسیدی دی اکسید گوگرد- اتانول- آب (SEW) انجام شد. متغیرهای مورد مطالعه در این تحقیق شامل دو روش شستشوی خمیر (آب- اتانول 40 درصد و آب)، زمان خمیرسازی (30 تا 100 دقیقه) و دمای پخت (120 و 135 درجه سانتی‌گراد) بودند. خمیرها با استفاده از اتانول 40 درصد با دمای 60 درجه سانتی‌گراد (L:W برابر 2:1) و سپس توسط آب در دمای اتاق شستشو داده شد. نتایج نشان داد بازده نهایی خمیر به دلیل انحلال بیش‌تر لیگنین در آب- اتانول 40 درصد نسبت به سیستم متداول (شستشو با آب) کاهش یافته است که این کاهش بازده از نظر آماری در سطح 1 درصد معنی‌دار می‌باشد. نتایج حاصل از خمیرسازی در دمای 120 و 135 درجه سانتی‌گراد در زمان‌های مختلف مشخص می‌شود که با افزایش زمان خمیرسازی از مقدار عدد کاپای خمیر SEW کاسته می‌شود. Vishtal, A. and Kraslawski, A., 2011. Challenges in industrial applications of technical lignins. BioResources, 6(3):3547-3568. Tan, T., Yu, J. and Shang, F., 2011. Biorefinery Engineering (Comprehensive Biotechnology: Second Edition), Acasemic Press: 815-828. Hui, S., Ying-kai, X. and Guo-zhi, X., 2010. Isolation of hemicelluloses from wood chips via extraction with kraft green liquor, chem. Res. Chinese universities, 26(4):667-671. Bajpai, P., 2013. Biorefinery in the pulp and paper technology. Elsevier academic press.ISBN: 978-0-12-409508-3. Sklavounos, E., 2014. Conditioning of SO2-ethanol-water (SEW) spent liquor from lignocellulosics for ABE fermentation to biofuels and chemicals, Doctoral Dissertation. Department of Forest Products Technology, Aalto University. Yamamoto, M., 2014. SO2-ethanol-water fractionation and enzymatic hydrolysis of forest biomass, Doctoral Dissertation, Department of forest products Technology. Aalto University. Fan, L., Ruan, R., Liu, Y., Wang, Y. and Tu, C., 2015. Effects of extraction conditions on the characteristics of ethanol organosolv lignin from bamboo (Phyllostachys pubescens Mazel). BioResources. 10(4):7998-8013. Moniz, P., Lino, J., Duarte, L. C., Roseiro, L. B., Boeriu, C. G., Pereira, H. and Carvalheiro, F., 2015. Fractionation of hemicelluloses and lignin from rice straw by combining autohydrolysis and optimised mild organosolv delignification. BioResources,10(2):2626-2641. Sridach, W., 2010. The environmentally benign pulping process of non-wood fibers. Suranaree J. Sci. Technol., 17(2):105-123. Iakovlev, M., 2011. SO2-ethanol-water (SEW) fractionation of lignocelluloscis. Doctoral Dissertation, Department of forest products technology, Aalto University. Sklavounos, E., Iakovlev, M. and Heiningen, A.V., 2013a. Study on conditioning of SO2-Ethanol-Water spent liquor from spruce chips/softwood biomass for ABE fermentation. Industrial & Engineering Chemistry Research.52:4351-5359. Sklavounos, E., Iakovlev, M., Survase, S., Granstrom, T. and Heiningen, A.V., 2013b. Oil palm empty fruit bunch to biofuels and chemicals via SO2-Ethanol-Water fractionation and ABE fermentation. Bioresource Technology,147:102-109. Survase, S.A., Sklavounos, E., Jurgens, G., Heiningen, A.V. and Granstrom, T., 2011. Continuous acetone-butanol-ethanol-ethanol fermentation using SO2-ethanol-water spent liquor from spruce. Bioresource Technology,102:10996-11002. Iakovlev, M., Hiltunen, E. and Heiningen, A.V., 2010. Paper technical potential of spruce SO2-Ethanol-Water (SEW) pulp compared to kraft pulp. Nordic pulp and paper research journal, 25(4):428-433. Sixta, H., Iakovlev, M., Testova, L., Roselli, A., Hummel, M., Borrega, M., Van Heiningen, A., Froschauer, C. and Schottenberger, H., 2013. Novel concepts of dissolving pulp production. Cellulose, 20:1547-1561. Iakovlev, M., You, X., Heiningen, A.V. and Sixta, H., 2014a. SO2–ethanol–water (SEW) fractionation of spruce: kinetics and conditions for paper and viscose-grade dissolving pulps. RSC Adv, 4:1938-1950. Iakovlev, M., You, X., Heiningen, A.V. and Sixta, H., 2014b. SO2–ethanol–water (SEW) fractionation process: production of dissolving pulp from spruce. Cellulose. 21(3):1419-1429. Iakovlev, M., Paakkonen, T. and Heiningen, A.V., 2009. Kinetics of SO2-ethanol-water pulping of spruce. Holzforschung. 63(6):779-784. Yamamoto, M., Iakovlev, M. and Heiningen, A.V., 2011. Total mass balances of SO2-ethanol-water (SEW) fractionation of forest biomass. Holzforschung. 65: 559-565. Iakovlev, M., Sixta, H. and Heiningen, A.V., 2011. SO2-Ethanol-Water (SEW) Pulping: II. Kinetics for Spruce, Beech and Wheat Straw. Journal of Wood Chemistry and Technology, 31:250-266. Iakovlev, M. and Heiningen, A.V., 2011. SO2-Ethanol-Water (SEW) Pulping: I. Lignin Determination in Pulps and Liquors. Journal of Wood Chemistry and Technology, 31:233-249. Iakovlev, M. and Heiningen, A.V., 2012a. Kinetics of fractionation by SO2-ethanol-water (SEW) treatment: understanding the deconstruction of spruce wood chips. RSC Advances. 2:3057-3068. Iakovlev, M. and Heiningen, A.V., 2012b. Efficient fractionation of spruce by SO2-Ethanol-Water treatment: closed mass balances for carbohydrates and sulfur. ChemSusChem. 5:1625-1637. Yamamoto, M., Iakovlev, M. and Heiningen, A.V., 2014. Kinetics of SO2-ethanol-water (SEW) fractionation of hardwood and softwood biomass, Bioresource Technology, 155:307-313. Saraeian, A,R. and Khalili, A., 2013. Pulp production technology with kraft process. Aiij Publications. 360 pages. (In Persian). Mirshokraei, S.A., 2002. Wood chemistry: fundamentals and applications (Eero Sjöström). Aiij Publications. 198 pages. (Translated In Persian). Mollae, M., Enayati, A., Hamzeh, Y. and Roostaee, M., 2010. Preparation of bleached soda pulp from canola stalks. 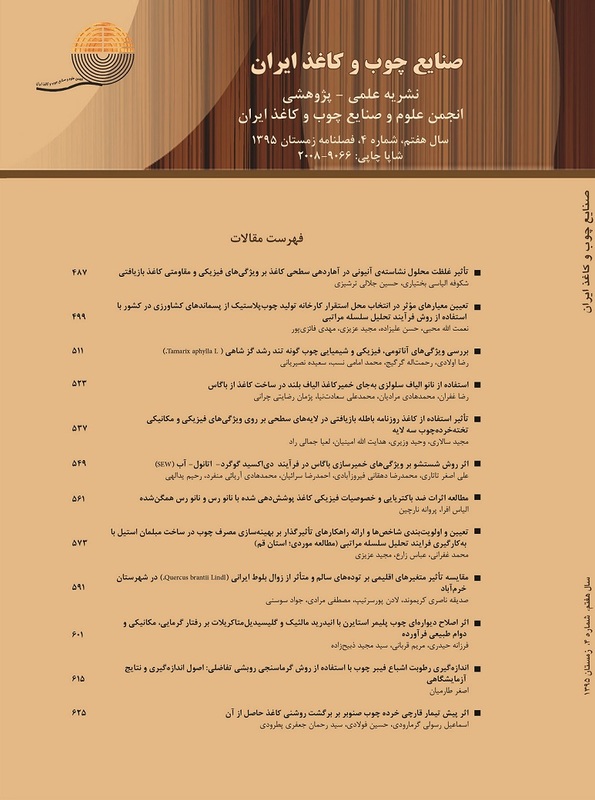 Iranian journal of wood and paper science research, 25(1):80-90. (In Persian).